Nowadays business owners are realizing that a strong web presence is absolutely essential for most types of businesses. It used to cost an arm and a leg to develop a website, but thankfully it has become much easier and much more affordable, thanks to Template Monster and content management systems like WordPress. Template Monster, or TemplateMonster as it’s sometimes referred to as, is a theme marketplace where you can find WordPress restaurant themes, Joomla restaurant templates, Drupal restaurant themes, HTML restaurant templates, and Bootstrap restaurant templates. 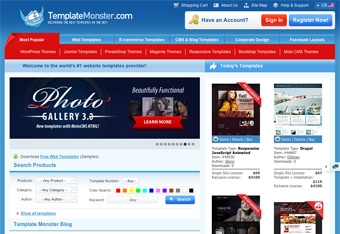 Designers and developers can join Template Monster and use it to sell their goods – themes, templates, etc. While you will find a ton of restaurant website themes and similar items at Template Monster, you will also find themes and templates that cover just about every niche. Since it is a marketplace and not a developer, Template Monster has one of the best selections of themes available anywhere on the Internet, with more than 20,000 website templates and another 450-500 designs added monthly! Plus, since there are so many developers, competition tends to keep the prices low, which is awesome for you! Template Monster is an excellent resource for business owners, because they provide the most choice and the most options. With every theme you will be able to choose what specifically you want to purchase. If you just want to use the theme for a single site, you can do that. Or, if you want to use the theme on several sites AND get hosting for those sites, you can do that too – all in one place! Template Monster is revolutionizing the industry for the better.